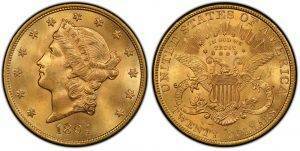 America’s largest circulating gold coin was the double eagle or $20 gold piece. As gold poured in from California it became important to increase production of the larger United States Gold Coins. The authorizing statute for the $20 Liberty Head Gold Coin was passed by Congress on March 3, 1849. The Liberty Head was used, a woman’s head with the word LIBERTY on the front. The reverse was Based on the Great Seal of the United States, it depicts a spread eagle with a shield on its breast, 13 stars in an oval with rays above. The nation’s name appears above, the denomination expressed as TWENTY D. below. The Type 1 (or No Motto) double eagles were struck at the Philadelphia Mint every year from 1850 through 1865, at New Orleans from 1850 through 1861, and at San Francisco from 1854 through 1866. The O or S mintmark is found below the eagle’s tail. Average mintages were several hundred thousand, but ranged up to just under three million for the 1861 issue. The San Francisco coins of 1866 were the last of the design, and were also issued as part of the Type 2 series, with the new motto IN GOD WE TRUST. Type 1 coins range from scarce to very rare in all Mint State grades. Branch mint pieces are particularly so, with many New Orleans issues numbered among the great rarities of the series. Low mintage New Orleans dates include 1854-O with 3,250 pieces struck; 1855-O, 8,000; 1856-O, 2,250; 1859-O, 9,100; and 1860-O, 6,600 pieces. Proofs of the series are also extremely rare, with two known of the 1850 and 1854 series. Only bankers ever saw a Proof coin from 1857 to 1865. Look for wear on the locks over Liberty’s ear and on the eagle’s head and neck. Bag marks are frequently found as well, even on high grade coins. Most collectors look for specific type, instead of date and/or mint mark. In 1866 the second design for the Double Eagle was introduced. The Mint Act of 1865 mandated a provision that the motto IN GOD WE TRUST be placed on all of the nation’s coins. Other mottoes were tried including GOD AND OUR COUNTRY, GOD OUR TRUST, and of course- IN GOD WE TRUST. The new motto was first added to dies for double eagles in 1866. There were two other minor modifications to the reverse: the sides of the shield that were formerly straight, curve outward on the Type 2 coins, and the tail feathers of the eagle are lower and closer to the lettered devices on the lower reverse, requiring smaller mintmarks than on the Type 1 coins. Other than the 1875 issue, all Carson City Type 2 double eagles are rare in mint condition, while the 1870-CC and 1871-CC are extremely rare. Only 3,789 pieces were struck of the 1870-CC. Today fewer than 24 Coins exist in all grades. Most Collectors look for all three mints and collect by type. Grading for Type 2 Liberty Heads focus on coin wear on Liberty’s hair behind the ear, eye brow and cheek; on the reverse, the eagle’s wing tips, neck, and top of the shield. In 1877, TWENTY DOLLARS replaced the TWENTY D. of the two previous issues. In 1877, the Liberty’s head was tilted forward and the denomination TWENTY D. was replaced by TWENTY DOLLARS (Type 3). The Type 3 Liberty double eagle was by far the largest mintage of the three types with 64,137,477 business strikes and 2,426 proofs minted from 1877 through 1907. Five facilities minted the coin during its thirty-one-year run: Philadelphia (no mintmark) and San Francisco (S) were the major producers, with Carson City (CC) augmenting mintage until 1893, New Orleans (O) striking coins only in 1879, and Denver (D) coming aboard for the last two years of 1906 and 1907. Mintmarks can be found on the reverse below the eagle. Grading is the same as previous issues. Because gold coins were exempt as long as they had historical value, most of the Liberties prior to 1933 survived. Many ended up overseas. This continues to be a benefit of those seeking additional protection from future confiscation, should the US government return to the “Gold Standard”. For Bullion Investors, the lower grade coins are an exceptional value. Grades range from Low Premium-Almost Uncirculated for circulated coins. For Uncirculated they range from BU (Brilliant Uncirculated to MS (Mint State). MS State Coins are most valuable when they are in a PCGS or NGC Container. The above designations are how coins are graded based on condition. LP = Low Premium, VF = Very Fine, XF= Extra Fine, AU = Almost Uncirculated, BU = Brilliant Uncirculated, MS= Mint State. 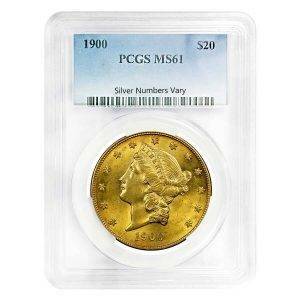 The Higher the MS Number the better the grade and the more it is worth when compared to same coin in lesser condition. NEVER BUY a Coin that is graded MS but not in an official NGC or PCGS plastic slab. Many coins have been polished and/or cleaned. This dilutes their value considerably. Pros: Great Investment for both Bullion in low grades and Collectors in High Grades. Lowest risk of confiscation of any gold US Coin. Cons: Beware of counterfeit coins. We check ALL coins with a spectrometer to certify gold content throughout the entire coin! 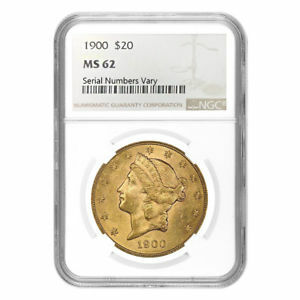 Rare coins should be certified only by PCGS or NGC! Recommendations: Buy as many as you can if you want gold. One $20 gold piece bought $2,000 in real goods and services in 1913 using today’s dollars. IDEAL COIN for our WHOLESALE CLUB MEMBERS! Examples of PCGS & NGC Graded Coins. Serial Numbers can be checked using our links above to verify authenticity. Buy $20 Gold Liberty Heads Wholesale! Click the Banner Below! You can also text us at 1-330-636-6292 for a quote. If You want specific years please specify in comments. IF YOU WANT HIGHER GRADES PLEASE INDICATE IN COMMENTS BELOW. LP- is the lowest grade and the lowest cost for gold bullion investors. If the Quote is Agreeable with You Let Us Know and we will send an invoice.